First time camping in Croatia? To make it easier for you, we gathered a list of things you need to know for an amazing road trip and camping adventure in Croatia. So you've hiked the Julian Alps, explored great caves of the Karst underworld, did adventure sports, explored green Slovenia from its north to its south … and now it is time for you to go camping and enjoy some vitamin sea in Croatia. Good choice! Croatia is the new coastal favourite in the European travel market, with it’s combination of stunningly long coastline (1,800 kilometers to be exact) and more than 1000 islands. This is a country that will slow you down: it is a perfect campervan country with fantastic beaches, glowing cities and towns, plus the natural parks that ooze charm and beauty. Croatia has more than 1000 islands and there are many hidden spots for you to discover and have only for yourself - even in high season. There is no better way to explore this country than with a campervan. Highways are new, modern and well-paved, distances are quite short and one has the freedom to stop wherever it feels right. Croatia’s infrastructure has improved massively in the last few years, making driving Croatia safer and easier than ever. The road south (called Jadranska magistrala) literally hugs the coastline and takes advantage of everything of the above – as you drive south, you have a constant view of the sea and islands; there are points where you are seemingly only metres away from the water. The cliffs on your left keep you by the coast and it is an absolutely stunning road to drive on. The Adriatic Highway (Jadranska magistrala) is a road that stretches along the eastern coast of the Adriatic Sea. What is more, Croatia has been recognized as an European camping destination No. 1 and for a good reason! Camping with campervans is allowed only inside registered campsites. There are more then 300 camping sites in Croatia and nearly 90% of them are on the coast with direct access to the beach, near most attractions and on larger islands. The rest is scattered around rivers and lakes. You have a choice of small family operated sites and larger camping villages or resorts with all the comfort you'll ever need. A list of all campgrounds in Croatia can be found here. Most campsites in Croatia are found along the coast and have their own beach. Camping season in Croatia is relatively short. Majority of Croatian campsites are open from mid-April to late September. The peak season, when the prices are at their highest, is from first week of July until the last week of August. It is recommended that you make advance bookings if you intend to camp during the high season, but anybody who ever camped in Croatia knows that there is always a free place in the campsite, maybe you'll just have to go and find it yourself. Campsites along the coast are located by the sea and come with their own beach. A pitch for two persons, tent or a campervan, equipped with electricity and water will cost you around 30 to 50 euros in high season. In low season it goes as low as 15 euros. Bear in mind that you will be charged a small fee for a city tax separately as well. Pitch prices vary according to the distance from the sea, and on-site services. The closer to the sea the pitch is, and more services it has, the more expensive it gets. If you want to be in the first row, you'll have to be willing to pay for it. The cheapest places in campsites in Croatia are called kamp mjesta (often translated into English as camping plots). Don’t get scared to stay at one of those places. These spots do have an electricity, but lack water connection. Their limits are not as well marked as on other pitches, but some of them can be very close to the sea, have great shade, and just feel like top spots for low price. 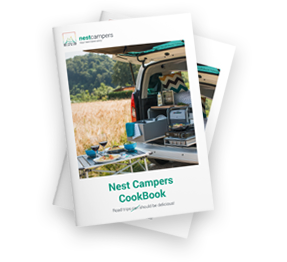 Nest Campers recommendation: always park your Nest at the reception, ask for a map of all available spots and walk around the campground before deciding which pitch you'll take. In Croatia it is strictly forbidden to camp in open areas outside registered campsites. Illegal camping (wild camping, overnight camping) is punishable by law, there is a 3000kn fine if you are caught, about 400 euros. You are only allowed to camp inside registered campsites or on parking lots expressly designated for campervans and caravans. Wild camping is forbidden in Croatia, but worry not - campsites are plentiful. Love camping AND being naked? Naturist camps are the way to go. There are plenty of nudist beaches on the Adriatic where people roam completely free, and everyone’s pretty cool about it (all naturist sites are signaled by the sign, "FKK"). Croatia was the first European country to open its doors to naturists in 1953, and today about 17 naturist campsites can be found along the coast. A common characteristic of Croatian naturist campsites is the high level of security, accommodation, beauty and peace. Simply take your clothes off and get that perfect summer tan! Who doesn't love skinny dipping? Camping in Croatia means waking up to views like this. We hope you find this post helpful and that you'll have an amazing time camping in Croatia. If you need more information or if you have any questions, please contact us and we'll be happy to help.